Working with brands like Toms is my dream. They use their talents, gifts, and finances to help change the world. And they do it in style! Since its inception in 2006 Toms One for One business model has given over 60 million pairs of shoes to children in need and inspired countless companies to follow its lead. As if that isn't amazing enough, they also went on to create a line of eyewear that is so on-point. Not surprisingly, numerous stars from the likes of Jennifer Lawrence to Kerry Washington sport them on and off screen. Needless to say I'm extremely humbled to feature such a cool company in today's post. The "Canadian Tuxedo" made famous by Bing Crosby* and then again in 2001's Super Troopers, has morphed into a street-style look that you can find all over the blogosphere. Being that its Spring, I opted to embrace the look with a light wash top from budget friendly, Melrose in the OC. The high waisted raw hem flares are from McGuire Denim. Sandstone colored leather clogs from featured brand, Toms, take this 70's look into 2016. P.S. These clogs are so comfortable and so reasonably priced - Under $100! Shop HERE. Photography by Rod Foster. Earrings, necklace, and bracelet from Gorjana for Rocksbox Use my code VanessaEbelXOXO to get your first month for free. Sunglasses: TOMS. Denim: McGuire- Now 40%off. *For a quick fun read on the history of Bing Crosby and the Canadian Tuxedo click here. Meet Mercedes. This woman made an impact on me the moment I met her 5 years ago at church. Her huge smile and bouncing curls accentuate her easy laugh and completely lovable nature. I always tease her that I want to fold her up and put her in my pocket. Maybe that way her contagious joy would drub off on me. The term 'pocket full of sunshine' is perfectly fitting for Mercedes and all the more as you get to know her darling daughter and Instagram mini-star...Sunflower Mae. Since I began Of Beauty & Grace I knew I wanted to create a series featuring inspiring woman whom I admire. Women who radiate beauty in the truest sense of the word and whose whole lives reflect the loveliness of their character and soul. Lets face it: our world is in desperate need of some new role models. I cringe when thinking of the shady icons that pop culture would have our daughter Isla Rose emmanate. Um, No thank you. Thankfully, there's a lot of truth and goodness amidst the darkness. Here's to the women who seeking a life of true Beauty & Grace. I dare you to not fall in love with Mercedes as she opened up with me in the following interview. Q. When did you decide you wanted to adopt a baby with Downs Syndrome? Q. Was Andy on board right away or did he need some time to process? A. Golly! In my mind Andy is just so perfect!!! After asking him," Can we adopt?" he said yes" right away. Then seconds later I asked, "Can we adopt a baby with Down Syndrome?" He said give me a day, but yes I think that we should." The next day it was a yes. With no hesitation a yes😍🎉 Cue the romcom music I just fell in love all over again!!! Q. What prompted you both to want to adopt before trying for any children of your own first? And this baby would not grow in my belly, but this baby grew in my mind and deeply in my heart. Q. How has life with Sunny changed since the birth of Rhodes? A. As to be expected with having your second lol! It's a whirl wind! Haha! No sleep, a messier house, I'm often late to things, I am overwhelmed, and I wonder if I'm giving them each my attention. All the while I am head over heels for my babies, I go above and beyond for them, seeing them play together and love on each other makes me want more! I love having two full arms of chaos😂 lol! Q.. How would you define living a life of Beauty & Grace? A. When you see yourself and others as beautiful no matter their looks it transforms your heart and mind. Grace is then the action of your heart and mind. Q. 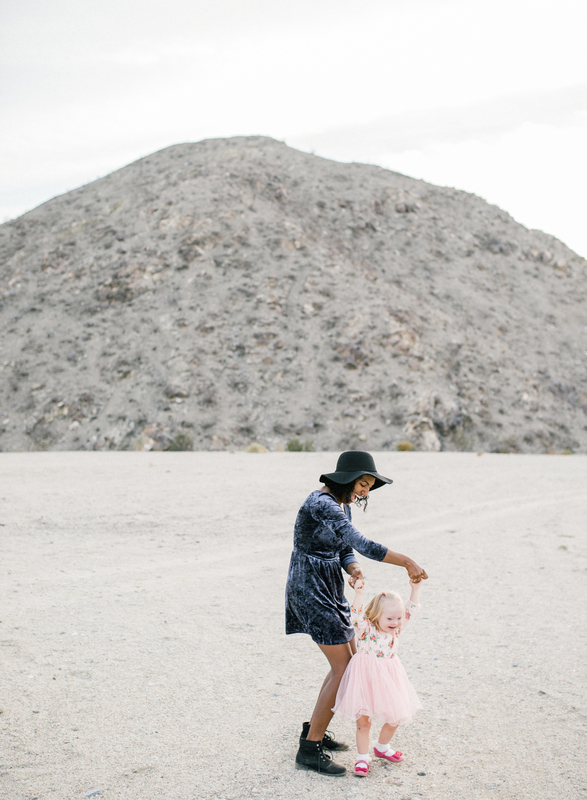 You (and your family) have such amazing personal style, where do you find your inspiration? Then continually adding. I love stand out pieces like a hat, vest or shoes that amplify an outfit or give it just the right edge to make you look and feel styled. Q. Tell me about Little Messengers? A. LM was birthed from our need to raise funds for adopting Sunflower. We started with baby head wraps and onesies. After raising the funds and becoming pregnant with Rhodes our second I took a break. I restarted with a friend and could not be more pleased! We have come back with a creative idea that is fashionable, stylish for mom and comfy for babies. Our Serape baby blanket is chic, on trend, adventurous and practical. We are currently in two stores Toes on the nose Laguna Beach and in 4 Hobie Southern Orange County locations. We have an etsy shop and have more actively ventured into the Craft Market world. Q. Who designs the product? A.My business partner Paige and I do. Q. Your Hooray for Sunny Instagram account is the sweetest thing I have ever seen. What prompted you guys to begin it? How has the success of this account impacted your lives? A. Hooray4sunny has brought connection, friendships, and support to our family. Sunflower was born with a rich testimony the very second she entered this world. Sunflower has Down Syndrome and was lovingly given up for adoption. We ( Andy and I) get to help Sunflower shape her life story as well as tell it in a positive inspirational way. We want Sunflowers life story to be viewed as BEAUTIFUL. And we feel Instagram is one really rad way to do it! I mean come on she's gorgeous and the camera loves her! Q. One of my favorite things has been seeing how you celebrate Sunny’s individuality all the while bringing a positive light to Downs Syndrome. How would you encourage other moms, such as myself who have children that stand apart from the crowd and may struggle with different developmental delays etc? A. Hmmm I am still learning this. But what I have learned for myself that as a mom I am so sensitive when it comes to my kiddos. I feel it so deeply when they hurt themselves or another child hurts them. I cringe and become defensive if an adult has a rude/ nonsensesicle comment about Sunny and her having a disability. My flesh becomes instant mama bear! But I have also found that when I am clear headed and not clouded by my emotions I can gracefully be Sunny's advocate, I can clearly articulate her needs or explain why she is doing whatever she is or isn't doing that is not "normal" to society. The way we handle positive or negative situations as parents of children with disabilities is so crucial! The way we treat our children in public for other people to see is so crucial! It's hard to be on All the time. I know. It's also our calling, whether we asked for it or not. For example I try to dress Sunny in cute clothes like her peers, Sunny wears foot braces I don't try and hide them I incorporate them into her look. Kids ask me about them and I answer in a positive upbeat way that these are foot braces that help Sunny to walk, run and jump better. I explain that Sunny has week ankles that are getting stronger everyday by exercise and her foot braces. I even ask if they would like to help Sunny walk up the playground stares or help her get on the slide. I have found kids LOVE to help and be in charge. They crave it! I give them different words to use when talking about the foot braces instead of weird I say aren't they cool. Isn't it rad that Sunny can wear these and now be able to play with you. I let them touch her braces and as best as possible take away the awkwardness. Another Example that's not so easy or pretty haha. Sunny has a constant runny nose and her tongue out which at times can cause a drooly boogery mess. I've had kiddos say "ew!" "She's dirty and messy!" I clean her up and explain to them that Sunny is still learning how to talk and how to help herself. I often turn it around and ask the concerned kid to please let me know if boogies start to come out again. I give them a job and ownership about how to handle the situation should it happen again. Taking personal sensitivity out of my knee jerk reaction to come to the defense of my "helpless" child, I am able to give others the more appropriate and kind way to approach a peer with special needs or a family member of a child with special needs. Breaking the awkward is one of our biggest battles. From ages 2-100 years old everyone is wondering how they should approach our kiddos and how they should approach as the parents. Let's try and give them a road map one conversation at a time. Don't shy away from awkward. Q. You live an extraordinary life, what motivates you? A. The pursuit of God's will in my life, not missing a blessing, not being ordinary, and the joy in helping others. Q. Who has been your greatest inspiration? A. Easy! Jesus, Andy, Sunflower and my mom! Q.How would you define your style? Q. What are your hopes for the Lara Family in 2016? A. First that our faith in the Lord deepens. Second our bond as a family deepens. Thirdly, I hope we each individually grow in a new and scary way. And lastly travel, I love to see a trip whether big or small on the calendar. I mean honestly....are we all not in love with Mercedes Lara now? I love how her cheery persona is felt throughout this interview. The girl is pure JOY! Follow her journey @hoorayforsunny and @thatmrslara on Instagram. Support her by shopping Little Messengers. Beginning with the prettiest blush leather iphone case from The Case Factory is the perfect compliment to a rose gold Iphone. I got this BKR glass water bottle for Christmas in the 1L size and I love how it encourages me to stay hydrated throughout the day. The queen of chic Olivia Palermo has teamed for a second time with California based Westward Leaning for a collection of sunglasses all handmade in San Francisco with stunning stone inlays on the temples and subtle hues on the mirrored rose gold lenses. Pointy toe lace up flats look perfect with cropped destroyed denim. Crochet swim suits are the "IT" suit to have this summer. I love the high neck on this one by Aussie brand, She Made Me. A classic saddle bag shape with a feminine edge by Botkier. A high shine nail laquer from ButterLondon made with good for you ingredients (no formaldehyde etc.) is uniquely designed to nourish your nails and give long lasting gel like color for 10 days. A spring trench in blush is the perfect addition to any wardrobe. I love this one from fellow blogger and fashion designer Emily Schuman for Cupcakes and Cashmere. To create that glowy healthy effect, use a cream blush like Stila's Convertible Color in Rose and apply a couple of thin layers to the apples of the cheeks to build up the color gradually. This is the time to be a little more bold with application, but keep in mind that blending is key! You want to look like you've just come in from the cold, not like a clown. Use the same cream blush and dab a light layer on the lips to pull the look together. For this look you can skip the eye shadow or sweep a quick wash of soft colored satin or shimmer shadow across the lid. So simple and so pretty! Before applying the blush and eyes, start with your show stopping lip. Skip the time consuming liner and apply, to smooth and lightly moisturized lips, a dramatic color straight from the bullet or by pressing the color in with your finger tip. Its a lot quicker and a more organic natural effect is achieved while still packing a punch with the color. For longer lasting color, use a matte lipstick like Nars Velvet Matte Lip Pencil in Mysterious Red or Rimmel's Lasting Finish Matte by Kate Moss in shade 107 . Once the color is on the lip you can better judge how much blush to apply without overpowering and taking the focus off the lip. To truly make the lip stand out, skip the eye shadow, apply a coat (or two if you prefer) of mascara and you're done! The key to this super fast eye look is to use one sultry or jewel toned color like Urban Decay Eyeshadow in Snake Bite or Make Up For Ever Artist Shadow Matte #844 Burgundy from upper lash line to just below the eye socket crease taking care to pack most of the color near the lash line and really blending the color in an almost gradient effect up and into the crease of the eye. You don't have to be too precise with the color because you want it to look smokey and sultry. Use the same color and smudge it under your bottom lash line making sure you connect the bottom smudge to the color on the outer corner of the eye lid. Follow with a couple of layers of mascara to make the lashes stand out against the darker eye color. Softly sweep a bronzer or warmer toned blush across the cheeks to warm up your face while keeping the eyes the center of attention. Finish with a quick swipe of a neutral colored or clear gloss on the lip and its time to party! Contributed by the lovely makeup artist Mariah Jones with Beauty and the Beach.